This is a regular series featuring my friends who have met celebrities. With over a year of being around Resistance Pro Wrestling, I have made a bunch of new friends and they are not all wrestlers. One of the first people I contacted and interviewed about R Pro was Sheri Shaw, R Pro's musical Director. Along with Brian Judy, Sheri is also part of sstaria. Sheri is as talented and busy as she is nice. Sheri is also a huge Veronica Mars fan. For a musician and VM fan, it must not get much better than having the Director of the show/movie put sstaria's version of the Veronica Mars theme song up on the Movies YouTube channel! She freely announces that she is super-excited and she should be. This is big news and we are excited for her. It really could not happen to better people than Sheri and Brian. We encourage everyone to check out the sstaria YouTube video "We Used to Be Friends." It is fantastic and I am not just saying that because Sheri is a favorite of JohngysBeat.com. We honestly really enjoy sstaria. As a matter of fact, sstaria's Resistance Pro Themed cd is in my car's cd rotation right now.. I borrowed the picture below of Sheri with (then) WWE champ CM Punk. One champ deserves another. Sheri was excited to meet the champ, but we think he should have been happy to meet Sheri. We know we always are! For more info on Sheri and sstaria, please visit the sstaria Facebook page or ResistancePro.com. Most important right now, check out "We Used to Be Friends" on YouTube! 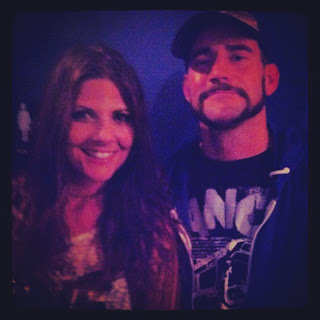 Sheri Shaw and CM Punk in Chicago, IL-Summer 2012.